A MOTHER AND her child have been rescued by French firefighters after yellow vest protesters set a residential building ablaze on another day of demonstrations in Paris. Protesters looted luxury stores and clashed with police this afternoon as part of the 18th consecutive weekend of demonstrations against French president Emmanuel Macron. 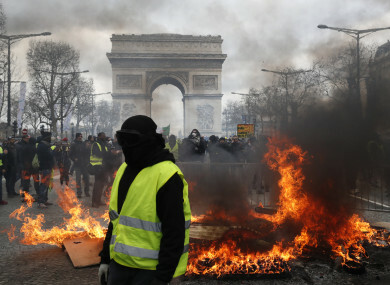 The violence started when protesters threw smoke bombs and other objects at police along the Champs Elysees and targeted a police van, prompting riot police to retreat. Fires were put out at two newspaper kiosks, which sent black smoke high into the sky, and several protesters smiled as they posed for a photo in front of one charred kiosk. Among the buildings targeted by demonstrators was a bank on the ground floor of a seven-storey residential block. Eleven people in the building, including two firefighters, sustained light injuries, as other residents – including a mother and child - were evacuated. Symbols of the luxury were also targeted, as shops selling Hugo Boss and Lacoste items were smashed-up and had their mannequins thrown out of windows. Interior Minister Christophe Castaner estimated that up to 8,000 demonstrators were in Paris today, including 1,500 “ultraviolent ones that are there to smash things up”. Castaner ordered police to retaliate against these “inadmissible” acts, condemning those who “call for violence and are here to ferment chaos in Paris”. French police attempted to contain the demonstrators with tear gas and water cannon with limited success. Paris police told Associated Press that 82 people were arrested by mid-afternoon. The rioting comes at the end of a two-month national debate that Macron organised to respond to protesters’ concerns about sinking living standards, stagnant wages and high unemployment. Email “Mother and child saved from apartment building set on fire by yellow vest protesters in Paris”. Feedback on “Mother and child saved from apartment building set on fire by yellow vest protesters in Paris”.